February 3, 2017 – North Berwick, Maine –Football season may be coming to a close this weekend but Hussey Seating Company is celebrating a particularly successful season. Not only are their regional favorite New England Patriots heading to the Super Bowl but the staff in North Berwick enjoyed a football season full of collegiate and professional level stadiums demanding Maine made seats. 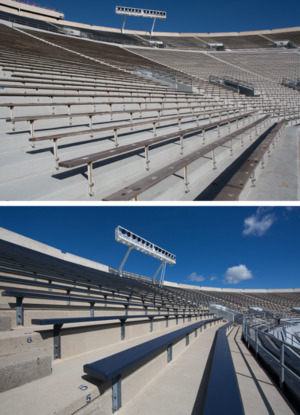 Notre Dame Stadium | Before and After RenovationsOn the collegiate level, Hussey Seating completed renovations on the upper bowl of Notre Dame Stadium. Hussey added Perma-Cap® covers, vinyl clad bench covers, throughout the stadium to replace the aging wood bench seats. Perma-Cap bleacher covers are a durable, maintenance-free, vinyl bleacher cover that fit over existing wood or aluminum bleachers. Completing the upper bowl is the first of two stages of seating renovations as part of the $400 million Campus Crossroads Project that includes construction of more than 750,000 square feet of classroom, research and student facilities among others. On the professional football level, Hussey Seating Company completed a total seating renovation of the 65,000 seat Nissan Stadium in Nashville, Tennessee, home to the Tennessee Titans. “We’re always proud to see our work in places that receive national attention,” said Hussey Seating Company President and CEO, Gary Merrill. “Hussey Seating employees work diligently to prove that Maine manufacturing can compete and win on a global stage and they’ve done it once it again.